Tickets are only $10 if purchased in advance. All seats are reserved on a first-come, first-served basis. All ages are the same price and all ages require a ticket, except babies under two years of age sitting on a lap. You will be able to choose the recital date (18th or 19th) on the next page, and then select your seats. You can only purchase tickets for one show at a time. If you wish to attend both shows, you will need to make two purchases. There is a small $1 convenience fee per transaction (so if you’re buying 4 tickets, it’s still only a $1 fee). After selecting your seats, you will have 5 minutes to complete your order, otherwise your seats will be released. The transaction is not done until you’ve made the payment. After placing your order, you will be able to print your tickets. An email will also be sent with a link to print them later, however it is best to print them immediately because those emails sometimes get lost or blocked by filters. If you have any trouble printing your tickets, do not fear! As long as your order went through, your seats are reserved. 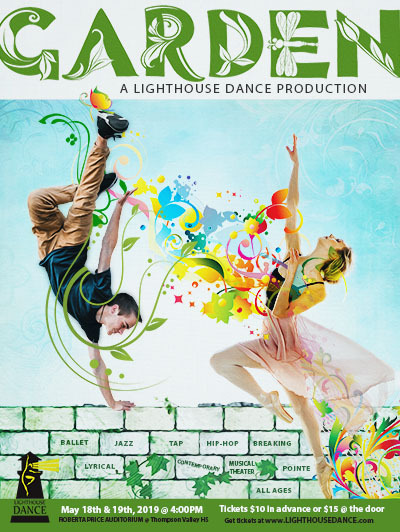 We can print your tickets at the Lighthouse Dance front desk upon request. If you wish to purchase tickets with cash or check, you can do so at Lighthouse Dance during our regular business hours (the $1 fee does still apply, as we still have to print your tickets through the ticketing system which charges us to use it). All ticket sales in advance must be completed by May 17th! Online ticketing will NOT be available on May 18th. Tickets can be purchased at the door for $15 based on availability. Please arrive early if you plan to get tickets at the door.